Spanish PM Mariano Rajoy, pictured in June 2016. This week he appointed a new Cabinet. Spain’s leader Mariano Rajoy, starting a second term after months of political paralysis in his country, formed a new cabinet last night (3 November) that looks set to maintain controversial economic reforms and cement EU ties. At the helm of a minority conservative government with little parliamentary support, Rajoy faces a daunting task as Spain grapples with separatism in Catalonia, seeks to consolidate its economic recovery and reduce its deficit under EU scrutiny. Foreign Minister Jose Manuel Garcia-Margallo, a stalwart of Rajoy’s Popular Party (PP), left the government and was replaced by Alfonso Dastis, 61, until now Spain’s permanent representative to the European Union. An experienced diplomat, Dastis was already in Brussels in 2012 when the EU decided to rescue Spain’s financial sector at the height of the crisis, thus avoiding a full sovereign debt bailout. In a move likely to reassure the markets, Economy Minister Luis de Guindos remained in his post, according to a government statement. The 56-year-old helped lift the country out of the economic crisis with sweeping spending cuts that met with criticism and mass protests. He has stressed that more efforts will be required to reduce Spain’s deficit as required by Brussels. Labour Minister Fatima Banez, who oversaw the implementation of much-criticised labour reforms, also remains in her post. The PP credits the reforms for helping reduce unemployment, which came close to 27% in 2013 and now stands at 18.9% – still the second highest rate in the European Union after Greece. The reforms reduced the amount of compensation companies must pay workers they fire and created a new open-ended contract with a one-year trial period. But the opposition says most of the jobs created are temporary and unstable. “We have opted for continuity on the economic team… a team that was crucial in reversing the economic situation that Spain was going through five years ago,” Rafael Hernando, parliamentary spokesman for the PP, told reporters. Opposition parties, though, were quick to criticise the new government, which they said was more of the same and would prove incapable of negotiation. “Those who keep portfolios dealing with some of the most important issues have more than demonstrated that they have zero capacity for dialogue,” said Socialist party spokesman Mario Jimenez. Rajoy kicks off his second term after 10 months of political limbo marked by two elections that produced no clear winner as two upstart centrist and far-left groupings upset the traditional two-party system. 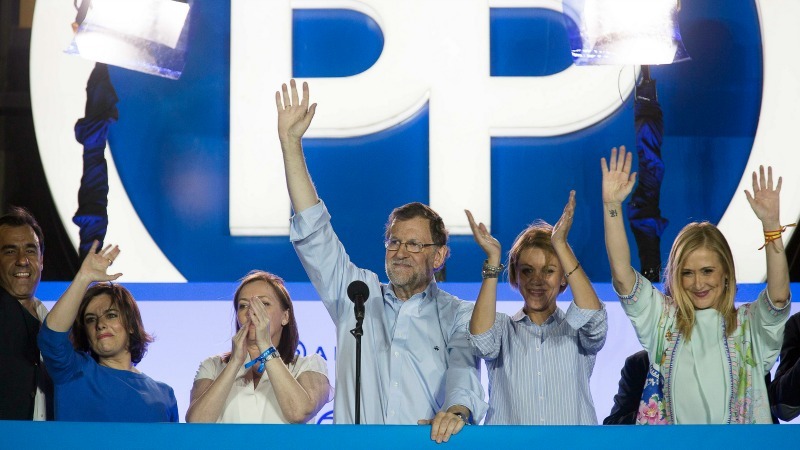 During that time, Rajoy – whose PP won both elections but without an absolute majority – remained at the helm of a caretaker government with very limited powers. His comeback was only made possible after the Socialist party decided to abstain in a crunch parliamentary confidence vote last Saturday, instead of voting against him. But unlike in 2011 when he came to power with an absolute majority, the PP only has 137 out of 350 MPs, meaning Rajoy will have to negotiate every bill with the opposition. Altogether, six new ministers make their appearance in Rajoy’s government, with the foreign, interior and defence portfolios all changing hands. As foreign minister, Garcia-Margallo had sparked regular spats with Gibraltar due to his vocal desire to see the British overseas territory returned to Spain, and it is unclear how much his successor will focus on the ongoing sovereignty row. Interior Minister Jorge Fernandez Diaz, who had been criticised over a new public security law that slaps hefty fines on unauthorised protests, is replaced by Juan Ignacio Zoido, former mayor of the southern city of Seville. Meanwhile Maria Dolores de Cospedal, until now secretary General of the PP, takes up the defence portfolio. Rajoy’s Deputy Prime Minister Soraya Saenz de Santamaria remains in her post, and also becomes minister for the regions. The 45-year-old will have the delicate task of managing Madrid’s relations with Spain’s 17 semi-autonomous regions, including Catalonia, where an independence drive is in full swing. erm… which ones of this new lot have corruption cases pending against them?